Access live and historic financial market data from DTN IQFeed in Matlab, using the IQML application. IQML is a Matlab connector to IQFeed, enabling users to leverage Matlab’s superior analysis and visualization capabilities, with IQFeed’s reliable data-feed of live and historic market data for stocks, ETFs, mutual funds, bonds, options, futures, commodities and Forex. IQML can be used for both automated algo-trading and selective manual trading, as well as continuous market data feed. IQML provides a reliable, easy-to-use Matlab interface to IQFeed that works right out of the box, and was optimized for excellent performance, reliability, stability and compatibility. A very detailed User Guide is provided, complete with numerous usage examples and implementation tips. Full solution – IQML provides easy-to-use access to IQFeed’s entire data-set within Matlab. Only the core Matlab and IQFeed’s client app are required – no additional toolbox or component is required. Stability – IQML has been extensively tested. It is rock solid. Inexpensive – IQML provides excellent value compared to other connectors of its kind or to the amount of time that would be needed to develop a similar robust connector from scratch. A fully-functional free trial version is available (see below). Easy to use – Users can access IQFeed’s data by simple Matlab commands, without need for any Matlab programming. IQML simplifies the IQFeed API in a very easy-to-use yet powerful interface that can be used by any Matlab user, novice or advanced. Novice and advanced users – Users can use easy-to-use Matlab commands, to access IQFeed’s data. Minimal or no programming is required to access this data. Blocking and non-blocking (streaming) modes – Users can receive IQFeed data both synchronously (waiting for data to arrive with optional timeout), and asynchronously (streaming data in the background). Settable market alerts – Users can define custom alerts on streaming news/quotes/interval-bars/regional-updates, which can be reported in various ways (popup window, console message, email, text (SMS) message, or Matlab callback function). User callbacks – Users can attach Matlab code (callbacks) to IQFeed messages. For example, this enables adding an entry in an Excel file, or sending an email, whenever a stock reaches a certain price or trade volume (also note the related alerts functionality). 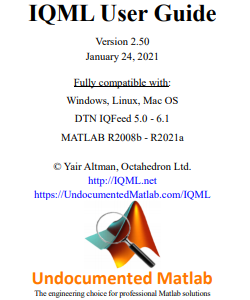 Compatibility – IQML works on all platforms where IQFeed runs (Windows, Mac OS, Linux), using practically any combination of IQFeed and Matlab release of the past decade (details). Security – IQML does not transmit any information externally except to IQFeed, so your trading information are as safe as your own computer. Performance – IQML is optimized for performance, providing fast and responsive connectivity. While Matlab as a platform is not well-suited for HFT, IQML enables receiving hundreds of streaming quotes or other IQFeed messages per second, with message latencies as low as 1ms and parallelization supported. Development – IQML was developed by an acknowledged Matlab expert, who wrote the reference textbooks on Matlab-Java connectivity and Matlab performance, as well as the acclaimed IB-Matlab connector (Matlab connector to Interactive Brokers). IQML is continuously improved and maintained. Backtesting – IQML does not include backtesting functionality. IQML’s author (Yair Altman) has extensive experience in developing complete backtesting and real-time trading applications. We will be happy to develop a new application based on your specifications, or to integrate IQML into your existing application, under a consulting contract. No other solution provides this rich set of features. Don’t take our word for it – download the free trial and check for yourself. You will not be disappointed. If you have any question, don’t hesitate to email us at info@iqml.net for additional information. Platforms: IQML works on all platforms on which IQFeed runs: Windows, Mac OS, Linux. IQFeed: IQML works with all recent IQFeed installations, including the latest IQFeed API (5.0-5.2, 6.0). Matlab: IQML works on all Matlab releases since 2008, including the latest release (R2019a). 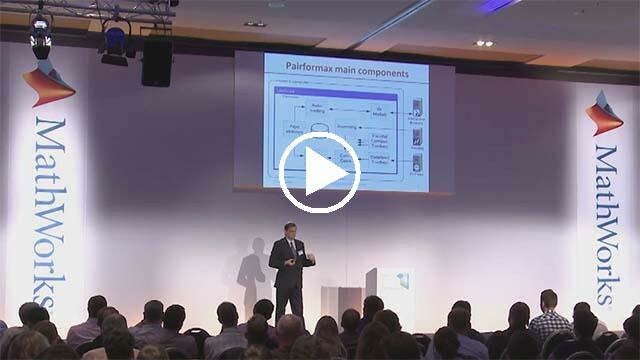 Presentation of a real-time backtest & trading system that uses IQML – a keynote address at the MATLAB Expo Conference in Munich, May 2016 (presentation slides, presentation video). For a detailed description of the functionalities in the following table, read the User Guide (PDF, ~150 pages). Corresponding usage examples for some of the important features can be found here. If you don’t see an important feature here, please let us know about it. Each Standard license can be upgraded to a Professional license for the price difference plus a $50 change fee. Contact us to get the payment link. The license cost includes free email support for installation problems, fixing bugs, and unlimited free product upgrades during the license term. Prices are subject to change from time to time. If you have any question, don’t hesitate to email us at info@iqml.net for additional information. Download a free trial of IQML with detailed installation and usage instructions. There are absolutely no strings attached: the trial is completely free and fully functional, just limited in duration (30 days). THIS SOFTWARE IS PROVIDED “AS IS”, WITHOUT WARRANTY OF ANY KIND, EXPRESSED OR IMPLIED, INCLUDING BUT NOT LIMITED TO THE WARRANTIES OF MERCHANTABILITY, FITNESS FOR A PARTICULAR PURPOSE AND NON-INFRINGEMENT. IN NO EVENT SHALL THE AUTHORS OR COPYRIGHT HOLDERS BE LIABLE FOR ANY CLAIM, DAMAGES, LOSS OR OTHER LIABILITY, WHETHER IN AN ACTION OF CONTRACT OR OTHERWISE, ARISING FROM, OUT OF OR IN CONNECTION WITH THE SOFTWARE OR THE USE OR OTHER DEALINGS IN THE SOFTWARE.